If you have just moved to a new house that has a garage, then you must be delighted with the new storage space, right? This extra room will help you keep your house decluttered and organised because garages usually serve as a great storage space. On the other hand, you might already know that garages can quickly turn into a dumping spot as you have been struggling to keep yours in order for years now. If this is the case, make sure you hire a trustworthy waste clearance in Edmonton N9, N18, for example, that will help you get rid of unwanted items and make your garage clean and clutter-free again. Nevertheless, if you are concerned about what to store and more importantly what not to store in your garage, you have come to the right place. We bring you useful tips on how best to use the extra space your garage provides and keep it organised. Gardening tools – lawn mowers, shovels, flower pots, hoses, etc. The garage is an ideal place to keep other infrequently used items. However, keep in mind that some objects just don’t belong there because they can get damaged or they can be dangerous. There are some items that should be stored elsewhere than in a garage for a variety of reasons. Items that cannot withstand temperature fluctuations shouldn’t be kept in a garage. Even if it is well-insulated, it is still exposed to outside temperatures more than the rest of your home. Also, if you have propane tanks and other flammable or hazardous materials, keep them outside your garage, in a well-ventilated area. But if you do choose to store toxic or flammable liquids inside, keep them in suitable containers that are clearly labelled. Never keep such items in ordinary plastic or glass containers. And always, always keep these items out of reach of children. Fragile items such as wooden furniture, electronics, wine and artwork shouldn’t be stored in garages as they can be ruined due to moisture, humidity, fluctuating temperatures and other factors. And finally, keep things that can attract pests away from this part of your house. Pet food, bedding, clothing and other can attracts rodents and bugs and cause damage you can only imagine. 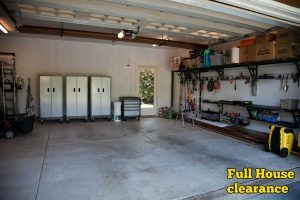 If you have a cluttered home, your garage might seem like an ideal solution for relocating junk in there. No matter how tempting this is, don’t just shove all your unused stuff into the garage. If you have clutter and don’t know what to do with it, contact the most affordable garage clearance in London and they will dispose of all your junk efficiently and responsibly. You will enjoy your neat, clean and nicely organised garage after the pros clear junk, old furniture pieces, unrepairable equipment and other rubbish out of your property. Copyright © 2019 Full House clearance.